An enthusiastic group of transportation wonks crowded Radio Room on Wednesday to test their knowledge of transportation, the Tilikum Crossing, and offer up a little trash talk at our 7th edition of Transportation Trivia. With their help we raised over $2,400 to support our Bicycle Repair Hub at New Columbia. 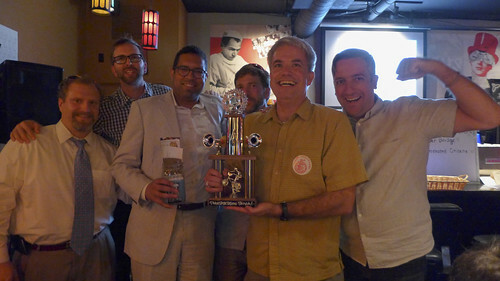 Long time players, [MUTCD][OMFG][RCTID] ended their second place streak in style by sweeping every round, earning great prizes from neighboring Alberta Street businesses. They managed 20 of the possible 31 points, just edging out the Dis-honored Citizens with 16 points, to take home the coveted Transportation Trivia trophy. Team “Tilikum As You Are, As You Were, As I Want You To Be” earned best team name and Full Cycle Coffee from Nossa Familia. This edition saw some of the most difficult questions yet. Can you name the three finalists (other than Tilikum Crossing: Bridge of the People) selected by the Bridge Naming Committee? Do you know what Portland zoning quarter section the west side of the Tilikum Crossing lands in? For those questions and more, check out the power point and answer key to see how you would fair. Thanks to our sponsors Lancaster Engineering, HHPR, Hopworks, and our gracious hosts, Radio Room for helping with another successful night. Thank you to our Alberta Street neighbors Modern Domestic, Gladys Bikes, Barista, The Shoe Store, Pine State Biscuits, Cupcake Jones, and Radio Room, as well as Portland Streetcar, Po Campo Bags, Nossa Familia, and PDW for providing prizes. Start studying; the next Transportation Trivia will be here before you know it.